Inspiration and Hope from a Science and Conservation Hero, Dr. Jane Goodall. Hearing Dr. Goodall talk about her early work and the conservation challenges we face today was one of the most inspiring events of my life. 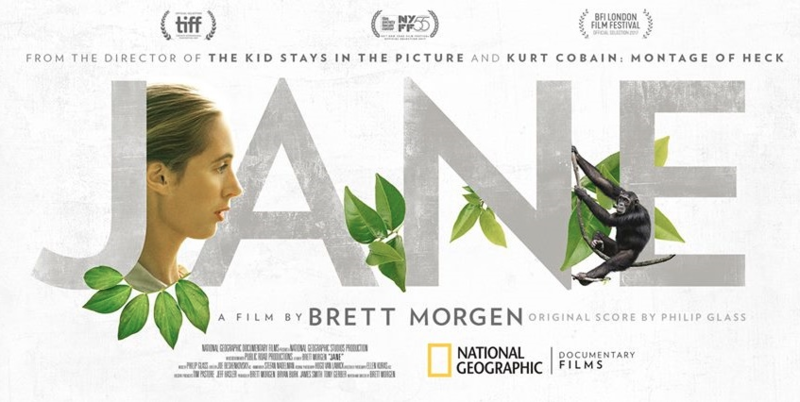 A household name and true legend of the scientific and conservation community, Dr. Jane Goodall was the first person to set up a long-term study of wild chimpanzees, and the first to document tool making behaviour in a species other than man. She now leads primate conservation efforts around the globe. I was lucky enough to attend a screening of her new documentary, Jane, followed by a Q and A with the woman herself. It was incredible. Georgia French, SharkStuff Founder and PhD candidate. When I heard about the screening, in the Bournemouth Odeon, I couldn’t believe that a titan of science was coming to my home county of Dorset. Turns out that Jane herself is from Bournemouth and the screening was a special event for her home town – and happily a very special event for me too. Hearing Jane speak about the trials she faced as a woman pursuing a life in the study of wild animals felt very relatable, even if our society has become more accepting of women taking on careers previously dominated by men (has it really though?). Jane was told by everyone but her mother that she couldn’t do it, that she couldn’t live in the jungle of Africa, that her dreams were foolish and should be put aside. Do you know what she did? SHE WENT ANYWAY. Media coverage of her work consistently focussed on her physical appearance, but her groundbreaking discoveries, a product of incredibly hard work, lead to a literal redefinition of mankind, valuable insight into our own evolution, and intimate understanding of a species almost completely unknown in the wild previously. Not only was her determination and indomitable spirit truly inspiring, her message for the future was galvanising. Jane’s take-home conservation message is that we can all help to make a difference. “Eat less meat, use re-useable products, by ethically sourced clothes” were just a few examples. Most importantly, we were urged to not give up hope, to not give in to the attitude that there’s nothing we can do. When asked what gives her hope and keeps her going in what feel like dark times, Jane replied that it was people, and their ability to not give up a fight. 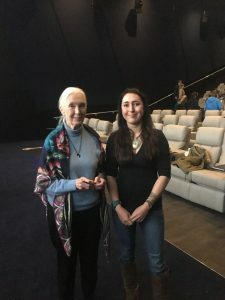 If you’re interested in getting involved with Jane’s work, check out the Jane Goodall Institute and for young people the Roots and Shoots programme – which has a group in Bournemouth!! “1, 2, 3…chimpanzee” whispered Dr. Goodall to me with a wry smile as we had our picture taken. Legend. 1, 2, 3..chimpanzee! A life-long dream come true. I can’t quite put into words just how much meeting this personal hero meant to me, how grateful I am for such a precious opportunity to thank her, and how much she has boosted my passions for wildlife science, conservation, and encouraging young women and girls to follow their dreams. We can all make a difference for wildlife (including Dorset’s sharks), let’s do it together! What's going on in the world of sharks? Our pilot porbeagle research trip was a big success - very quickly!